Many women are unhappy with their appearance due to what they deem a “double chin” due to excess fat around the jaw and neck. Others are unhappy with loose skin in that same area (the “wattle” as many refer to it thanks to Richard Fish’s obsession with it on the now-defunct “dramedy” Ally McBeal). 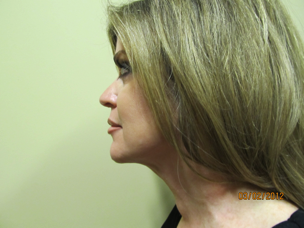 With just one procedure, the SmartLipo Necklift at The SHAW Center, women can say goodbye to unwanted neck fat and loose skin, regain confidence and smile back at the reflections in their mirrors. The SmartLipo Necklift can take years on a woman’s appearance by eliminating excess fat as well as tightening the skin in one simple procedure. The procedure does not actually suction fat; however. The SmartLipo device used at The SHAW Center has two laser wavelengths – one that melts fat via laser and the other for tightening loose skin. Oftentimes just one procedure can give women the appearance of women 10 years younger with minimal downtime and scarring. In fact, SmartLipo is recommended due to its minimal scarring. The procedure can be completed though a tiny one-millimeter-wide incision. For dramatic results, the procedure can be combined with liposuction. The SmartLipo Necklift is the ideal option for women that are not in need of an entire facelift, but want to do some subtle contouring to help them look younger and feel better about their appearance. The SmartLipo Necklift can also be combined with other facial sculpting procedures for enhanced results and a more youthful look overall. As always, schedule an appointment at the SHAW Center to discuss your interest, questions and concerns with Dr. Shaw regarding the SmartLipo Necklift and/or any other procedure.